What is more surprising: a goat in a tree or a tree in the desert? The mighty argan tree manages to combine both spectacles. This survival artist of the Moroccan desert collects water in its leaves, making them a delicacy for thirsty goats. Most of the year the tree, whose crown can reach a diameter of up to 14 metres (40 feet), shows little or no growth but during the rainy period it comes to life, hastily producing abundant growth of leaves, flowers and fruits. However, it is another two years before the olive-like yellow fruits ripen - not long considering that the tree can reach an age of up to 200 years. Inside the fruit is a large nut about 3 cm in diameter. This in turn contains between one and three drop-shaped seeds or kernels which are smaller than sunflower seeds but rich in a valuable oil. 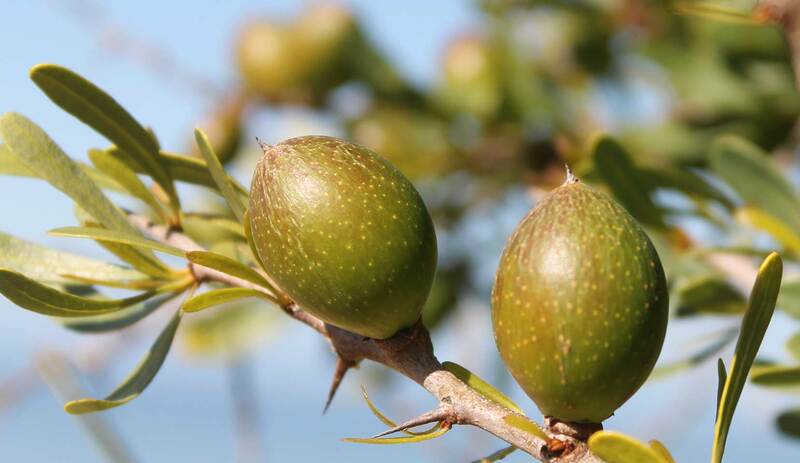 A fine fragrant golden yellow oil is extracted from the kernels of the argan tree. Argan oil - Morocco's liquid gold. 20 kg of kernels are required for one litre of oil. The oil is used for the manufacture of cosmetics and pharmaceuticals but is also valued in gastronomy. The Berbers of Morocco have used it for centuries because of its unique properties which are said to be superior to those of olive oil. Its natural antioxidants are believed to have numerous positive effects on skin and health by destroying free radicals. The oil protects the skin from drying out and makes it soft and supple, it is reputed to reduce wrinkles, improve brittle nails and dry hair and slow down skin aging. Used properly, argan oil can accelerate the healing process after burns and relieve redness and eczema. The oil is used traditionally in Morocco to treat acne, chickenpox and haemorrhoids. On account of its high content of essential unsaturated fatty acids the nutty tasting argan oil is of particular nutritional value. The argan tree is one of the oldest trees on earth. It is believed to have grown over 80 million years ago in south Morocco. The first written record is in the writings of the famous physician Ibn Al Baytar in the year 1219. Today Berber women still obtain argan oil by an ancient process. After the harvest from July to September the fruits are dried in the open air. A stone is then used to crack open the hard nuts and obtain the kernels. These are roasted over an open fire and ground to a pulp in a hand-driven stone mill. This is mixed with water to form a paste which the women then knead by hand to extract the argan oil. The dried fruit pulp and the press cake left after extraction of the oil are fed to cows and sheep. Because of its intensive use as forage for goats and camels and as firewood the argan tree population was over-exploited - old trees died and no new trees grew to replace them - so that there was nothing left to prevent desertification and soil erosion. In 1998 the UNESCO therefore declared the argan region - the Arganeraie - a biosphere reserve. Since 1995 the GTZ (German Association for Technical Cooperation), commissioned by the Federal Ministry for Economic Cooperation, has been engaged in reafforestation of the argan woodlands. A subproject within the biosphere reserve are women's cooperatives whose existence is based on the production and marketing of argan oil. As valuable ingredient of Dr.Hauschka Sheer Lipsticks and Regenerating Neck and Décolleté Cream argan oil cares for the delicate skin, making it smooth and protecting it from drying out.